STILL a working fishing town, much of Estepona’s cash flow surges from the port. The importance of the maritime trade is obvious at the Ethnographic Museum, which showcases the ancient craft of boat making and the cornucopia of marine life living off this golden coast. Museum guide Mariano Jobreas, who moved to the town from Madrid, shows me a wall displaying dozens of complicated knots. “To become a fisherman you have to learn to tie every single one of these. You have to be prepared for all eventualities out at sea,” he says gravely. The models of fishing boats still in use look so real, he jestingly assures me that the working vessels are much bigger. On a trip to the port to see if I can spot any of them in action, I bump into Miguel Ferrer Gonzalez. “I came here because Estepona is more of a family town,” he beams, explaining that he spends his days sailing around in search of dolphins. It sounds like money for old rope as dolphins aren’t hard to find – beach goers often spot shoals of them frolicking offshore. “It’s not an office job, and if you like the sea, this is the job for you,” agrees Miguel. If you’d like a turn at the helm yourself, the Real Club Nautico houses a sailing and kayak school with a dry dock for sailboats and a nautically-themed restaurant for hungry sailors returning home from the sea. 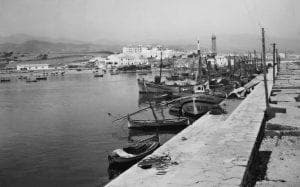 Estepona is still home to hundreds of working fishing families whose ancestors have been casting their nets here for centuries. Now this great maritime tradition is continued by their offspring who continue to brave the elements to this day to put fresh fish on local dining tables.